Everybody dreams about the perfect bedroom, but for some people the budget is more limited. However, there are a few décor tricks that may highlight yourbedroom personality and help give this comfy space a true makeover. Even if the furniture may look damaged, it may be just old and dusty, so it can be restored, and even improved. Take for instance that old cushy chair that doesn’t have a place because it is too ugly, even if it is really comfortable. Take it out and cover it with an interesting fabric slip cover in order to obtain a unique piece of furniture. Don’t be judgmental regarding second hand furniture because in those shops you can find many unique pieces that may become designer-like objects. For instance you can buy a random headboard and remake it to resemble the ones from designer catalogues. Keep in mind that vintage and shabby-chic styles are still in fashion. Create a bedroom reading corner where you can put a tall bookcase. Paint it if necessary, in order to match the rest of your ensemble. Add a vintage standing lamp, an armchair and a little restored table, and the perfect spot will be created. For more elegance, add a decoupage finish to the surface of the table and add a vase of flowers. In every bedroom the bed should have a central place. Reposition it against the larger wall in order to increase the room’s size. If you don’t have a headboard, paint one on the wall. It will create an interesting effect. 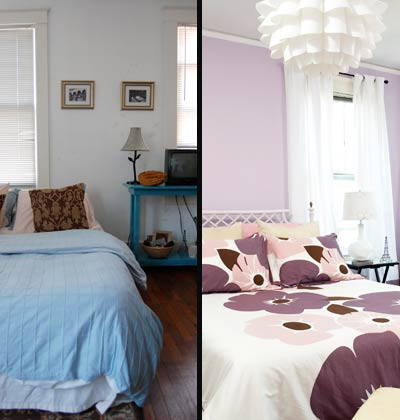 Add a bedspread and matching pillows, and combine their color with the curtains and the carpet. Blank walls are cold and unwelcoming, so you should suspend a few paintings, or maybe a collection of interesting photos. You may also find a place where you could hang your children’s artwork. Buy a mirror and paint its frame in the desired color. Hang it over a dresser and you will certainly have ready a statement of glamour. There are some objects that may have multiple functions. Buy a bed that has storage drawers under it, or some nightstands that have drawers and cabinets. Transform an old suitcase into a bedside table or use a stack of old books for the same purpose. The effect is guaranteed. When you have something that doesn’t match, as for instance your nightstands or the dresser, paint them in a more suitable color. You may do the same with frames and headboards, and even some lamps. The colors should reflect your personality, so take time before buying a certain paint.